The Insurance Industry reports over $200 million in water damages a year related to washing machines each year. Most of us never think that one event caused by the washing machine can quickly create serious damage to our house in less than a few hours. In fact, if one of the water hoses connected the washer were to break, it will release approximately 600 gallons of water in an hour. The cheapest insurance to protect against a bursting water hose in the house is to turn the water off at the wall after each use.. Congratulations if you have the conviction and memory to do this on a daily basis…. I don’t. Most washers are equipped with standard light duty water hoses rated for 3-5 years of service. At the least, a yearly inspection can reduce the risk, but it still not a guarantee that it will protect you from an inevitable flood. Yearly Inspection: At the least, performing this inspection will further reduce the probability of having a flood associated with the washing machine. Clearance: The washer should maintain a 4-5 inch gap between the back of the washer and wall. Ensure the hoses are not crimped or kinked. Hoses: With the water on, grab the hoses and move them around to ensure they are still very pliable. Granted, they will be a little stiff since they are under pressure. 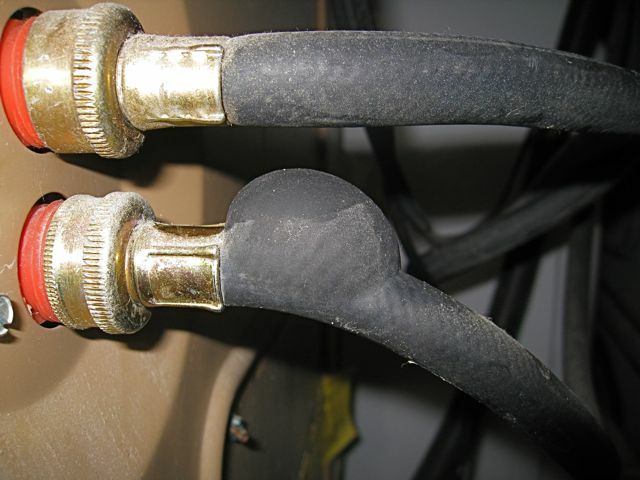 Run your hands over the entire surface area of both the hot and cold hoses looking for any abnormalities, such as bubbles (like in the picture) or surface cracks. 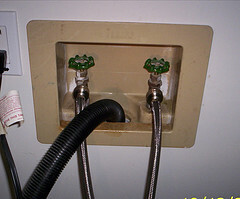 Move the hoses in a circular motion specifically around the collar terminations at the washer and at the wall. Typically this is where the hose will break. Be ready, this inspection may cause the hose to leak or break. If so, be ready to turn the water off. TIP: As with all plumbing work, make sure you can successfully turn the water off before starting the inspection. ANY amount of water detected is enough to warrant replacement of the hoses, unless the leak is at the threaded connections. Connections: Make sure the threaded connectors are tight at both the wall and the washer. Hose Inspection Part II: Turn the washer on to warm, as the washer is filling up, turn the water off (H&C) at the wall. Turn the washer off allowing the hoses to drain a bit into the washer. Inspect the rubber hoses again for pliability. Final Inspection: When finished with #4, turn the water back on and reset the washer; re inspect the hoses and connectors for leaks. Standard Replacement Rubber Hoses: With a life expectancy of the 3-5 years and a cost of *** and an hour of labor to do it. If you have to use a professional, add another $75 bucks, it’s about $100 every 3 to 5 years or $300 over the lifetime of the washer. TIP: This is a fairly simple exercise similar to changing a garden hose, but you will have to move the washer around to get to the hoses. Metal Braided PVC Hoses: Considered an upgrade, easily acquired at the big box store and priced at approximately $30 for the pair. With a life expectancy of 5 years (at best). These hoses give the appearance of sustainable life, but in reality the stainless steel braiding serves to protect a standard type PVC hose from the natural elements, otherwise it would not be anymore durable than the standard rubber hose. It can break easily at or near the connectors as well. High Grade Rubber Hoses: If you have been around much construction equipment, you are well aware of the use of rubber hoses used in hydraulics. These hoses are under constant high pressure at the tune of about 1400 lbs. Our last recommeded supplier of high quality hoses went out of business. HomeownerBOB will investigate another solution and update this post accordingly. Ok, so this solution wasnt good enough for you, here are some items that are belts and suspenders. However, for me, the upgraded hoses are more than adequate. I say this because the solenoids will stop the water in the even of a flood, they also induce new failure points that are not worth it in my book. Electric Solenoids: Floodstop will detect water on the floor and tell the water to shut off at the washer connection. Water Alarm Detector: This device works in conjunction with your burglar alarm activating an alarm condition that would report to you or the burglar alarm monitoring company. NOTE: Unfortunately, by the time you get home, the damage is done. Whole House Flood Detector: This is the premium solution as it allows sensors any where and everywhere. If you house is over 10,000 sq. feet, you might consider this, otherwise its pretty expensive. You are currently browsing the Homeownerbob's Blog blog archives for January, 2015.